Thank you for the writeup. I’m so copying this 🙂 Are you controlling the Gimbal directly from the receiver? I see that you have not connected it to the Naza? Yes, I’m controlling the gimbal directly from the receiver. I have experimented with the auto stabilisation in the Naza. It works very well, but with cheap direct drive gimbals like this one it is less than useful. Makes more vibrations than stabilisation. You need a proper belt driven gimbal if you want good auto stabilisation. I have it in there simply because I want to be able to tilt the camera down. Even the over expensive Gaui Crane III are not any good with out the right controller so i understand. I’m waiting impatiently for the new “brushless gimbals”. I’m sorry to ask again. But the “dampeners” you show on https://eirikso.com/2013/03/13/a-simple-to-build-foldable-spider-quad-for-ap-and-fpv/img_0168-copy/. Where did you get them? 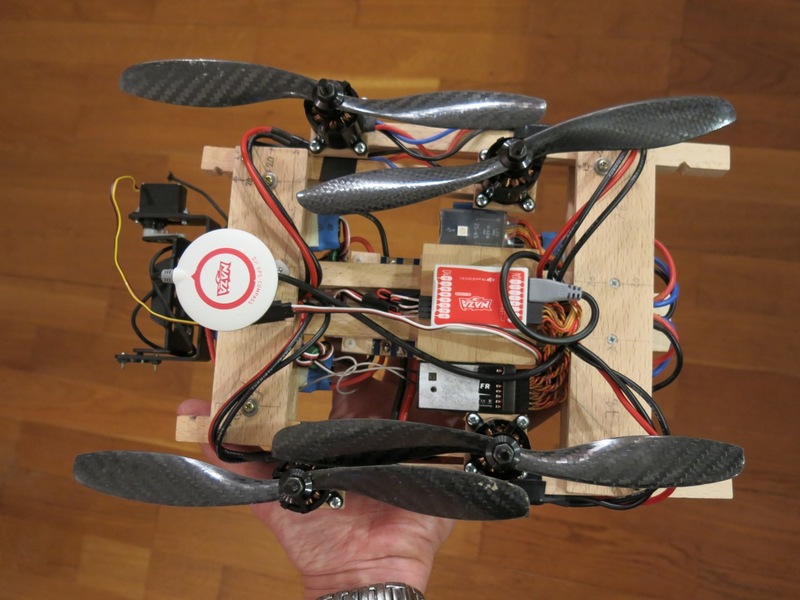 …and by the way: I updated the article with some FPV test clips. No jello with the GoPro Hero2 at 720@50P with ND. Nice build again! What kind of servos are you using? The 500 kr Hitec HS-5245MG is pretty good, used by some semi-expensive gimbals. Mine burned right away though, possible due to hangup. I have recently tracked down a couple of good servos from HK, the GWS Naro super and the Hitec HS-81. They are a lot smoother than average and won´t kill your budget. Just stumbled upon your site cos of the moose video.. Im just thinking about getting into AP after having got a toy heli for christmas from my wife you knows Im a big kid! Anyway, IM just saying Hi, and maybe you can give me some advice sometime. Absolutely LOVE this wooden machine.. excellent! Dear Eirik, I found your time lapse ‘One year in 40 seconds’ on Vimeo. Awesome mate. Would I be able to use part of it in a 15 second Television commercial please? I am from Sydney, Australia, it would be on air for 3 weeks. Unfortunately it seems like FilesForever is down right now, but I guess it will be up again in a matter of minutes. Ser ut som at du har brukt en del tid på planleggingen her, ser f.eks hakkene på armene som passer fit stoppskruene osv. Likte også det at den er litt bredere bak slik at armene foldes inn og ligger paralelt med de forran. Har desverre ingen tegninger. Bygget en prototype og gikk så rett på denne. Men den fungerer så bra at jeg skal se om jeg får målt opp alt og laget en tegning. Hakkene i armene er en løsning jeg er fornøyd med. Det hele er jo bygget for hånd, så da blir det ikke 100% nøyaktig. Ved å file ut hakkene litt kunne jeg etterjustere for eventuelle unøyaktigheter og sørge for at rammen er så symmetrisk som mulig når den er slått ut. Ok. Jeg tror det skal gå fint å få til noe bare utifra bildene dine også. Det gopro festet med tilt, Hva heter det/hvor er det kjøpt fra? Har eget FPV-kamera. Er bare ikke montert på bildene. Kan ta noen flere bilder når jeg får tid. I’d also like to see the pictures that neokiller62 asks for. Do you mount the battery on the same dampened layer as the camera is mounted? If so, why? If not, why not? Thanks for great guides, I’ve built both the nrkbeta quad and your foldable guides. Both fly very nicely. I’ve now added several images of the dampeners and the platform. I mount the battery on the platform together with the camera. I want as much weight as possible together with the camera. That helps soften the vibrations. Excellent! That’s what I’m doing as well. And: I’ve now crashed it seriously for the first time. It behaved very well. The arms folded and the only damage was a broken prop and a damaged motor mount. It took me 15 minutes to make and install an new motor mount. I think it’s great what you’ve done. How high can fly your unit? How much you have to invest in order to build something simple? Much success to ongoing construction and update. In Norway it’s not allowed to do recreational RC flying above 400 feet. But technically a quad like this can go much higher than that. 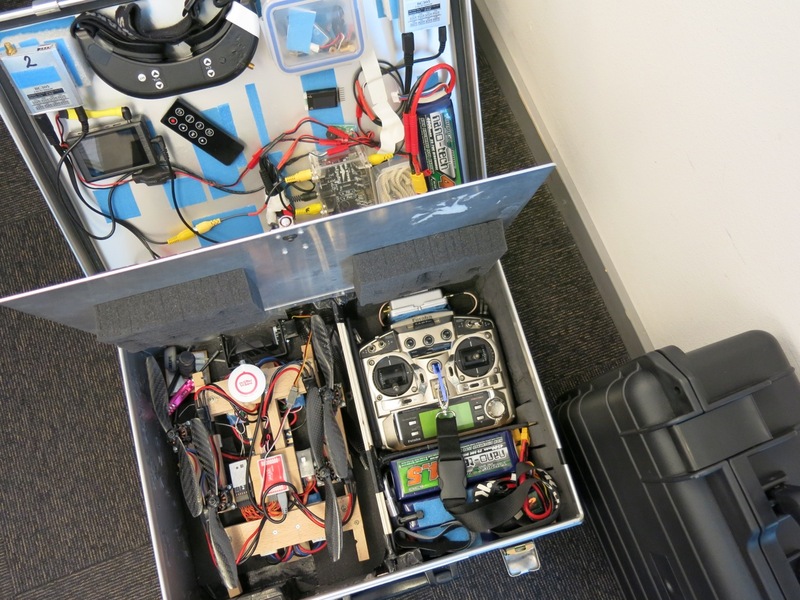 Then you add a couple of dollars for props, cables, batteries etc. Har ingen helikopter til salgs. Can you recommend a good gimbal setup to use with the Sony Rx 100? I am going to be using the NAZA-M VERSION 2 as a FC. Any help setting up a Sony Rx100 to a F550 platform would be appreciated. Thanks! Har lenge lett etter kombinasjon av FPV kamera/varmesøkende/ir..